Patricia Clare Ferriter was born on April 25, 1909, in Dickinson, North Dakota, to John Ferriter and Katherine McNertney. She began painting as a child when she was in bed for a full year with an illness. In the late 1920s, Clare attended the Massachusetts School of Fine Arts. From 1931-1933 she lived in the Philippines, where her father was stationed as an Army captain. Part of the time she worked worked as an illustrator for The Manila Times, an English-language newspaper. It was at this job that she dropped her first name and from then on used the name "Clare Ferriter" exclusively. She received a B.A. in Art at Yale College in 1935. This was one of the few departments of the school that accepted women at this time. She then went on to study at Stanford University where she received an M.A. in Art. She was particularly interested in the Siennese School, and her thesis involved work in egg tempera, a Renaissance technique. During the years of 1937 -1942 she worked at the Bridge Gallery in New York City and lived on Horatio Street in the West Village. A number of her works were in a show there and these were reviewed in the New York Times. She painted still lifes, street scenes, and portraits in oil. After a few years she took a job teaching art at Westover School, a private girl's school in Connecticut, though she spent weekends at the Horatio Street apartment and continued to paint. In 1942 she married John Tilton Hack and had two children; one born in 1944 and one in 1949. She gave up her focus on painting until the early 1950's. She and her family moved to Washington, D. C. around 1943 or 1944, where she remained for the rest of her life. In the 1950's she resumed painting, again working in oils on realistic subjects. During this time she became noted as a portrait artist in the Washington D.C. area. She began painting abstracts and stills in oils. One influence was conversations with a Russian scientist colleague of her husband's, who steered her to Kandinsky. Kandinsky's work was in part influenced by approaches involving how the spiritual can be captured in or represented by shapes and colors. It seems she was attracted at a subconscious level to the possibility of expressing the spiritual through abstraction. At some time in the 1960's she became influenced in part by a fellow Washington artist named Margery Deo. Clare then began painting collages using various sorts of paper--often handmade Japanese rice paper--and acrylic paint. She became the second President of the new Washington chapter of Artists Equity Association in 1967. Under her leadership, the Washington chapter of AE established a public gallery known as the Art Barn in Rock Creek Park. This was accomplished with the collaboration of the National Park Service. Out of this effort a book was published entitled "Washington Artists Today." In the early 1970's she developed a collage technique that employed various types of metal leaf (gold, bronze, tin, and "combination" leaf). She put down a base layer of an acrylic, put metal leafs and thin papers over that (perhaps black ink in places), and used "sgraffito" (scratching some of the metal or paper away to reveal the base acrylic) to create the final product. Her major show in this style ("Metallics") was in 1973 at the International Monetary Fund. Her last one-person show was a few years later at her commercial gallery, the Franz Bader Gallery. After that she retired from public showing, with the exception of an occasional individual contribution to group shows mounted by old friends or organizations of which she was a member. After the I.M.F. show, she began experimenting with colored inks, and in the 1980s produced a series of extremely bright-colored paintings using colored papers and inks. Unfortunately many of the papers, and some of the inks, used "transient dyes" that fade severely in sunlight or simply with the passage of time. Many of these paintings are considerably faded today. The "metallics" and some of the 1980s ink collages are probably the artistic peak of her career. Most of the metallics were only seen publicly once, at the I.M.F. show, and then either sold or given away. Most of the later ink collages have never been seen publicly, though a few were sold somewhat sporadically. space, and images of nature-- particularly the sun. She stopped painting around 1987. She died on December 31, 1994, and was buried at Arlington Cemetery in Section 6 Site 8753 Lh. The Smithsonian Archives of American Art maintains The Clare Ferriter Papers with records of her works from 1931 -1978. Born Patricia Clare Ferriter in Boone, Iowa, on June 18, 1909. She began painting as a child when she was in bed for a full year with an illness. 1931-1933 Lived in the Philippines, where her father was stationed as an Army captain. Part of the time she worked worked as an illustrator for The Manila Times, an English-language newspaper. It was at this job that she dropped her first name and from then on used the name "Clare Ferriter" exclusively. few departments that accepted women at that time. art. She was particularly interested in the Siennese School, and her thesis involved work in egg tempera, a Renaissance technique. 1937 -1942 She lived and worked in New York, working at the Bridge Gallery, living on Horatio Street in the West Village. A number of her works were in a show and were reviewed in the New York Times. She painted still lifes, street scenes, and portraits in oil. After a few years she took a job teaching art at Westover School, a private girl's school in Connecticut, though she spent weekends at the Horatio Street apartment and continued to paint. gave up painting from 1942 to the early 1950s. She and her family moved to Washington, D. C. around 1943 or 1944, where she remained for the rest of her life. Early 1950s she resumed painting, again working in oils on realistic subjects. During this time she became noted as a portrait artist in the Washington D.C. area. Beginning in the mid 1950s, she began painting abstracts, still in oils. One influence was conversations with a Russian scientist colleague of her husband's, who steered her to Kandinsky. Kandinsky's work was in part influenced by approaches involving how the spiritual can be captured in or represented by shapes and colors. It seems she was attracted at a subconscious level to the possibility of expressing the spiritual through abstraction. At some point in the 1960s, influenced in part by a fellow Washington artist named Margery Deo, she began painting collages, using various sorts of paper--often handmade Japanese rice paper--and acrylic paint. In 1967 she became the second President of the new Washington chapter of Artists Equity Association. Under her leadership the Washington chapter of AE established a public gallery, the Art Barn, in Rock Creek Park with the collaboration of the National Park Service, and published a book of Washington artists, "Washington Artists Today." 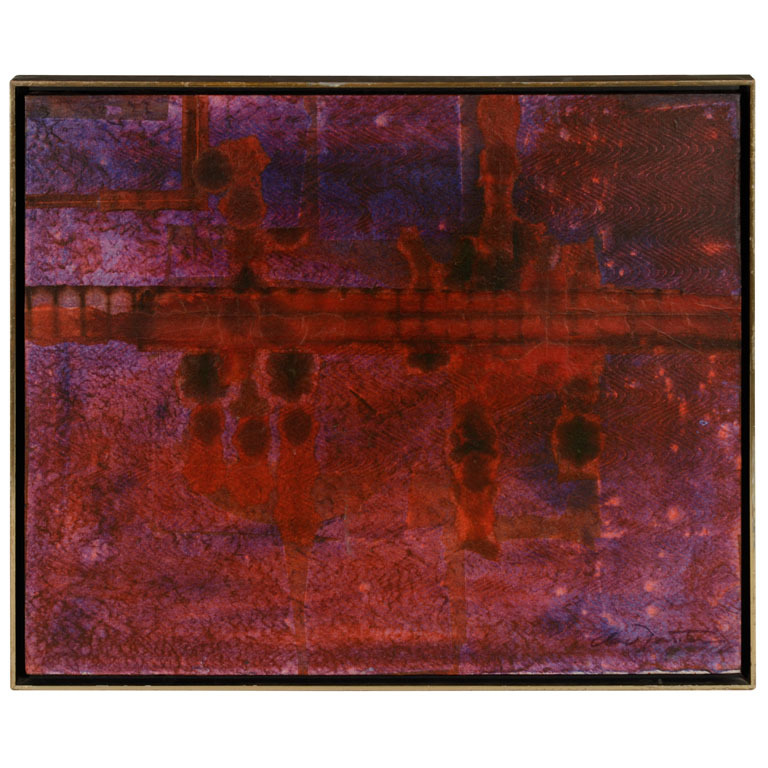 In the early 1970s she developed a collage technique employing various types of metal leaf (gold, bronze, tin, and "combination" leaf). She put down a base layer of an acrylic, put metal leafs and thin papers over that, perhaps black ink in places, and used "sgraffito" (scratching some of the metal or paper away to reveal the base acrylic) to create the final product. Her major show in this style ("Metallics") was in 1973 at the International Monetary Fund. Her last one-man show was a few years later at her commercial gallery, the Franz Bader Gallery. After that she retired from public showing, with the exception of an occasional individual contribution to group shows mounted by old friends or organizations of which she was a member. After the I.M.F. show, she began experimenting with colored inks, and in the 1980s produced a series of extremely bright-colored paintings using colored papers and inks. Unfortunately many of the papers, and some of the inks, used "transient dyes", dyes that fade severely in sunlight or simply through the passage of time. Many of these paintings are considerably faded today. The "metallics" and some of the 1980s ink collages are probably the artistic peak of her career. Most of the metallics were only seen publicly once, at the I.M.F. show, and then either sold or given away. Most of the later ink collages have never been seen publicly, though a few were sold somewhat sporadically. space, and images of nature, particularly the sun. She stopped painting around 1987. She died on December 31, 1994 and is buried in Arlington Cemetery in Section 6 Site 8753 Lh. The Papers of Clare Ferriter (1931-1978) are on file at the Smithsonian Arichives of American Art. Gather together a story on your ancestor for our website, get a picture and upload it to our site.